The Don Walker Memorial Scholarship awards at least $1,000 in scholarships students at Marquette University or the University of Wisconsin-Milwaukee who are pursuing a career in journalism. The MPC Endowment Ltd. is a 501(c)(3) Wisconsin-registered non-stock corporation. Donations are tax deductible to the fullest extent of the IRS regulations. The Don Walker Scholarship would not have been possible without its leadership sponsors. Please click here to learn more. 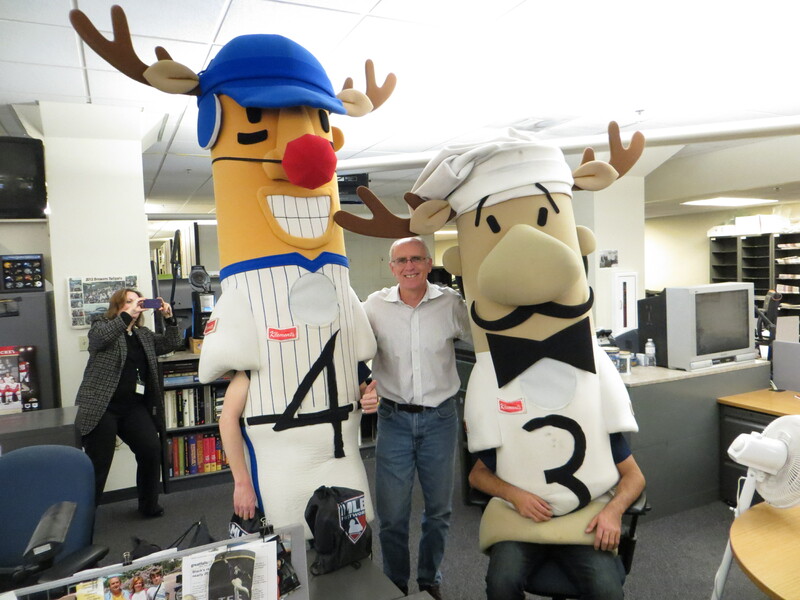 Don poses for a photo with two “Racing Sausage” in the Journal Sentinel newsroom. Photo courtesy of Sue Walker.